This is it, the catalyst. It all began here. This is the mod that sparked my recent Star Wars obsession, which even months removed from its discovery continues to fan my self-destructive flames. 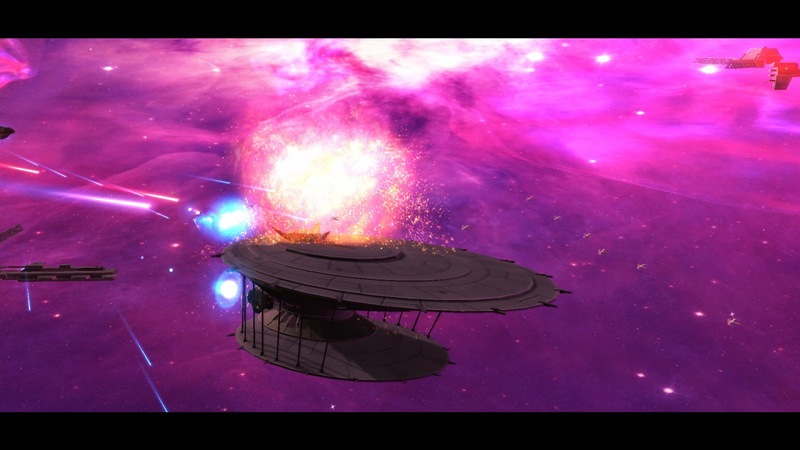 This is Thrawn’s Revenge: Imperial Civil War, the mod that demanded far more of my time than any other game released this year. This is the only mod that I’ve ever played, for Empire at War or indeed any other game, which I consciously felt could have been sold as an actual sequel, or at least an expansion. 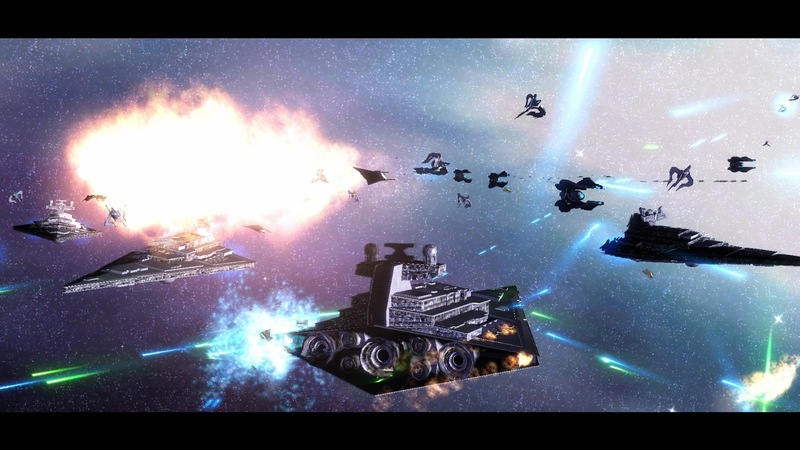 Thrawn’s Revenge: Imperial Civil War got its first release in 2010, with version 2.1 releasing late 2013, and a 2.2 update currently in the works. 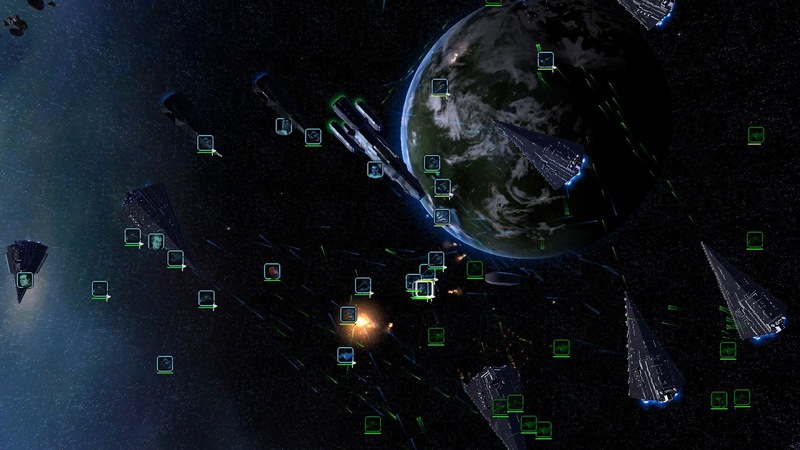 All told the mod’s been in development nine years, the same team is also hard at work on a Sins of a Solar Empire: Rebellion mod, called Thrawn’s Revenge II: Ascendancy, currently in beta. Thrawn’s Revenge takes place after the Battle of Endor (Episode VI), and spans approximately twenty years. The Empire has fractured along many dangerous territorial lines, while the Rebellion has reformed into the New Republic. It’s a fascinating period of the Star Wars timeline especially for someone who grew up on the prequel trilogy, as I’m guessing the majority of fans my age and younger did. The Galactic Civil War, portrayed in the original movie trilogy is of course the era I love most, but it’s also the one I was least versed in, until discovering this mod. Simply because so much of the expanded universe post-Endor is older than I am, the Timothy Zahn Thrawn material specifically; the original Thrawn trilogy came out years before I was born, and the subsequent Hand of Thrawn duology released when I was like three years old. I was always aware that this period of Star Wars lore existed, but approaching almost two decades of fiction is a tall order. I avoided it where ever possible, telling myself it’s old, therefore obviously worse than the shiny new Clones Wars material. It wasn’t until I downloaded Thrawn’s Revenge on a whim, and began piecing together parts of the timeline, establishing character basics, and reading dozens – nay, hundreds – of Wookiepedia entries to fill in my many gaps, that I realised yet again my ignorance had kept me blind. I had shunned a trove, a wealth of good (occasionally great) fiction for no reason other than its age, or more accurately the age of its roots. It was a revelation I found all the more fortunate now that Disney has severed that whole arm of fiction, that entire generation of stories from the official canon. It is sad, knowing now that there’s so much quality in the expanded universe that will never be explored officially again. That said it was pretty thoroughly charted, and those stories do continue exist, even if their existent will remain largely ignored by the larger Star Wars fan base. This mod will live on to ensnare others too curious for their own good, to launch people like myself into a crusade through what feels like reams of arcane text, driving them to listen to audio books recorded in an age before Marc Thompson, and to slave through comics with seemingly no concept of pacing. But alas, I digress! Had this mod not played as well as it does, I wouldn’t have stuck around long enough to become hooked on the lore. Thrawn’s Revenge has five factions on offer, three are Imperials of one sort or another; the Imperial Remnant, the Pentastar Alignment, and the Empire of the Hand, as well as the New Republic, and the Duskhan League. The Imperial Remnant forms the core of what the Empire became following the Battle of Endor and is led by various admirals, including Thrawn himself. The Remnant is fragmented further by the Warlords; admirals and Moffs fighting for their individual agendas, a struggle represented well in Thrawn’s Revenge. While the Pentastar Alignment is a splinter faction formed by one Grand Moff Ardus Kaine, around the planet known as Bastion, which would later become the Imperial Capital. The Empire of the Hand is literally a breed apart, created by Grand Admiral Thrawn in secret, the Hand shares some Imperialistic elements but consists almost entirely of Chiss (blue skinned, red eyed beings heralding from the Unknown Regions). The Chiss (Thrawn is one himself) use their own technology; new types of Star Destroyers, the far more elegant Clawcraft, and maser weapons, most of which was only ever described in books and never actually illustrated, making the inclusion of the swelling Empire of the Hand roster in this mod all the more impressive. I give the highest praise possible when I say the models fit in well, they look different but totally at home alongside the classic Star Destroyers and X-wings. There are different strains of ships and technology; some older fully-Chiss designs, others more evidently Imperial in nature, and some influenced by other sources, but they all stand together as one coherent faction. An Empire of the Hand fleet (blue) engages the Imperial Remnant (green). The New Republic has changed a great deal since the days of the Rebel Alliance, wielding a roster replete with bulbous Mon Calamari starships, bolstered by Star Destroyers of their very own. The odd one out is the Duskhan League, with a smaller roster and only a brief appearance in the campaign scenarios. The League consists of the alien Yevethans, and was the force behind the Black Fleet Crisis (another two-decade old trilogy of books). A Hapan Battle Dragon under fire. There are also smaller, technically unplayable factions, including the various Imperial Warlords and the Hapan Consortium, but their roles are not static. 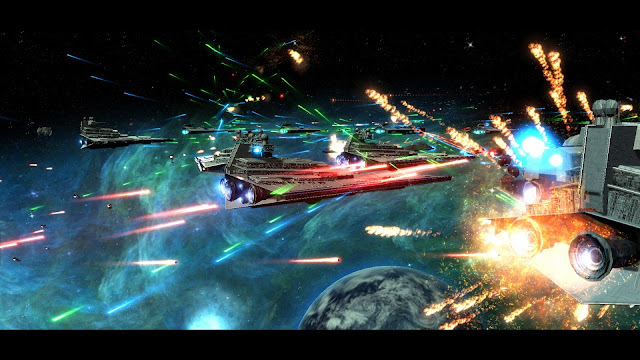 Thrawn’s Revenge offers more than a dozen Galactic Conquest (campaign) scenarios, ranging from 6 ABY, two years after the Battle of Endor, up to 25 ABY, the year the Yuuzhan Vong War began. 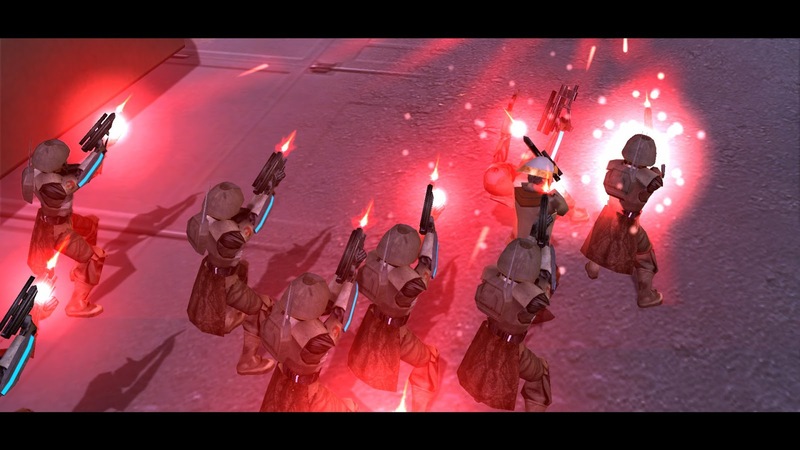 The roles of the Imperial Warlords and Hapans change significantly, depending upon their respective allegiances to the factions of each scenario, for example; the Hapan Consortium may be an independent power opposing you in one scenario, while the next could see you leading a joint New Republic-Hapan action against the Remnant. The Warlords are a little different, unlike the Hapans who have their own unit roster, the Warlords are Imperials, so too are the majority of their forces, however specific Warlords have access to specific units; Zsinj can recruit his Raptors for example. Just as the Hapans are tied to the New Republic in some scenarios, the Warlords are at times part of the greater Imperial Remnant faction. It’s this attention to detail that most licensed videogames don’t even try to approximate, that I find so damn impressive. It isn’t just the individual campaigns that portray different times in the Star Wars history, Thrawn’s Revenge uses an 'Era System'; a cunning development of the game’s technology system. Rather than using a researchable technology to simulate the advancement of the state of the galaxy and unlock new units, Thrawn’s Revenge progresses only when a key character of that era, all of which are central Imperial Remnant figures, has been defeated, usually killed. That’s another thing; hero characters stay dead, because the hero respawn timer has been removed, mostly. However, there are considerations both for and against progressing to the next era, because doing so will unlock new units for all factions, not just your own, as well as give rise to new characters, reflecting the prominent figures of the new era. All of the character appearances adhere to the old canon, so some you’ll have probably already fought earlier in the campaign, hence they ‘mostly’ stay dead. It’s a genius system, so much more engaging than researching technology, and far more Star Wars; just like in all of the fiction, each time Luke and his friends strike down one Imperial tyrant, there’s another waiting to take their place. The space combat of Thrawn’s Revenge has easily become my favourite, one could argue it’s simply because it boasts the greatest density of Star Destroyers, but there’s more to it than that. The balance of the ships; their damage, speed, and defences, usually feel representative of the power you would expect. It’s difficult for me to be more definitive than that because I’ve played so much of Thrawn’s Revenge I can’t reliably divorce myself from the balance I’ve become accustomed to. On the ground though things turn a little murkier; Thrawn’s Revenge sets a blistering pace for its ground combat, which makes strategizing very difficult. That’s probably a bad thing for people who normally enjoy land invasions, but as I’m not one of them, I find the increased speed useful. It allows me to spend far less time on land and more in space. The blaster fire looks great though, and that’s honestly half the battle when it comes to Star Wars. New Republic troopers literally light up a street. The unit roster is huge, huge! There’s a Star Destroyer for every eventuality. Despite most of the factions being Imperial-influenced, if not full Imperials, their unit lists are very different from one another. You can study and compare all in the beautiful 138 page PDF document included in the download. You think I’m being weird, fawning over a PDF but it really is a step beyond; the formatting, presentation, and scope is greater than even the finest manuals of yesteryear.